Pike County Historic Preservation Trust Recognizes Richard Pedranti Architect’s Restoration of Milford’s Historic Anthony Brooks Building after a Devastating Fire. 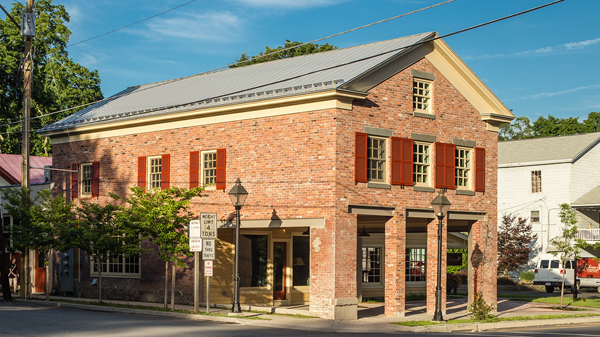 A historic preservation project by Richard Pedranti Architect (RPA), a full service architecture firm focused on energy efficient design, was honored by the Pike County Historic Preservation Trust. Last night, the high-performance historic preservation of the Anthony Brooks Building, located in the heart of the Milford Pennsylvania Historic District, was awarded the Thomas W. Hoff Stewardship Medallion in recognition of substantial contribution of historic preservation. The Hoff Medallion award, established in 2015, is an award that recognizes historic structures and landscapes, along with their owners and caretakers, for stewardship of historic structures and landscapes. Without the efforts of these individuals, families, businesses, and organizations, the structures would be lost to us all. Constructed in 1850, the two-story commercial building originally served as a general store. Throughout time is was also a grocery, the Milford Steam Laundry and more recently an auto service and repair station. The building was renovated in 2012 by its current owner Deb Brooks, who operates Ambiance Furniture & Fine Gifts out of the first floor. Ambiance offers a wide array of handmade antique reproductions modeled after pieces found in European country homes, foreign palaces, estates and even the White House. The building’s first floor also acts as a meeting space for Progressive Health, which is owned by Deb’s husband Paul, and features an apartment on the second floor also managed by Progressive Health. In April of 2013, an electrical fire destroyed the building’s timber frame and severely damaged its brick façade. Committed to replicating every historical detail of the building, Deb and Paul enlisted RPA to restore the building to its once honored state while adding an environmentally-friendly focus. RPA worked with general contractor Dakan Enterprise out of Honesdale, PA because of their 20 years of experience in residential and commercial construction. RPA and Dakan took the Brooks’ request to restore the building “brick-by-brick” literally – counting every brick and documenting the detailed remains of the building in order to replicate the building’s historic details to perfection. This allowed RPA and Dakan Enterprise to capture the idiosyncratic dimensions and materials of the building, and faithfully restore the historic fabric of downtown Milford. RPA also worked closely with the Milford Historic Architecture Review Board (HARB) to ensure the renovation satisfied the requirements of the HARB ordinance. To ensure comfort, RPA designed and engineered the building with a 21st century high-performance assembly, establishing exceptional levels of energy efficiency. The building was energy modeled to perform well beyond current building code, and will save Deb and Paul thousands of dollars in energy costs each year. In addition to the environmentally-friendly design, RPA was also able to add more retail space on the first floor and expand the second floor apartment. Now complete, the Anthony Brooks building is, as much as ever, an integral part of the streetscape of the Milford Pennsylvania Historic District and its community. Richard Pedranti Architect is an innovative architecture firm located in the heart of the Upper Delaware River Region specializing in environmentally conscious building strategies. The firm is distinguished by its proven ability to create beautiful buildings that achieve the rigorous Passive House standard. Combining intelligent modern design and 21st Century building standards, RPA creates simply extraordinary places that exist in harmony with the environment and fulfill the unique aspirations of each client.